Elena is the manager of Minajoya, the local goldsmith cooperative partner of Amalena. She was born in La Llanada, in the South of Colombia like most of our artisans. 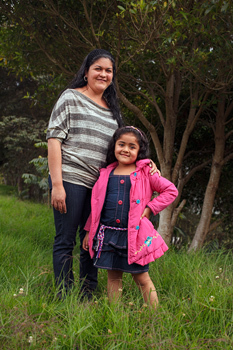 Elenas husband studied to be a sports teacher but couldn’t find a job in this profession and is working as many others in La Llanada in the gold mines. It’s a tough work in the mines and their five year old daughter Maria sees her dad only on the weekends. Since an early age Elena was interested in the art of making delicate jewelry. She had learnt the traditional filigree techniques that have been used since centuries in Colombia in her hometown. To improve her skills and learn different and new techniques of goldsmithing she had to leave La Llanada and move 1.200 km North to join the Jewelry Trade School for four years. Since then Elena has been working for 13 years now as a goldsmith and has continued to visit jewelry workshops whenever she had the chance to. One she is especially proud of is a jewelry course with four goldsmith masters from Vincenza, Italy. One can see the various influences Elena incorporates in her jewels. She loves to integrate filigree techniques to more contemporary designs and combining old traditional techniques with new ones. Today Elena is teaching others the art of making precious jewels. She has been the mentor in the last years of the goldsmith cooperative in La Llanada and has trained all of our goldsmiths. As the manager of the local goldsmith cooperative, she knows how important it is for all the goldsmiths, that their work gets recognized and valued. She says that all of the members of Minajoya have one thing in common and that is that “making jewelry is our passion”. 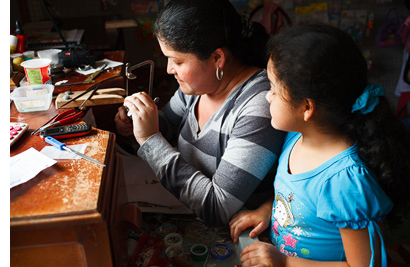 Making jewelry has helped Elena to finance her education and is now an important source of income for her and her family.